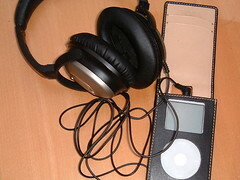 I carry an iPod with canalphones (shure, etymotics, ultimate ears). 30dB earplugs, plus good quality headphones -- a bit more portable and discreet than over-the-ear headphones, AND you can wear them under an aviation headset or shooters earmuffs. Canalphones are enough isolation for helicopters, noisy cargo jets, or small arms. Plus, you can hook them up to a radio/mic with an adapter (or to a cellphone), and wear just one when you want to be able to hear the outside world. Etymotics + muffs is better for .50, incoming or outgoing artillery, etc. And, they are approximately the same size as the ipod earbuds, so it fits in a pocket.